I only bought this range of papers ( Graphic 45 secret garden) the other day, but I couldn’t wait to start creating with it. it is by far my favourite range of papers at the moment! 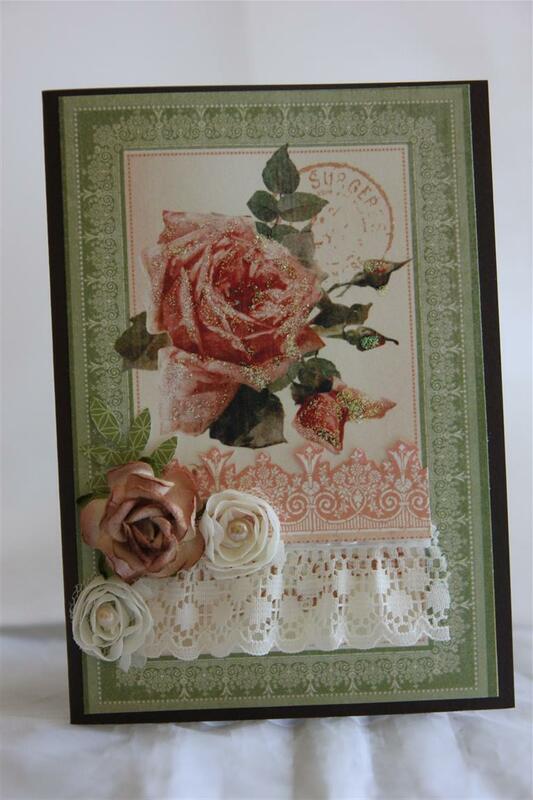 This first card is very simple, just one piece of patterned paper onto my card base, a little fussy cutting of another sheet and some lace, stampin up trim , a flower and some leaves punched from martha stewart frond punch to finish.Still hot here, I taught a very small class this morning, and we had some issues with the glue drying too quickly ( thats never happened before) so once again, there will probably be no crafting tonight – I am a bit over this hot weather! Til tomorrow…. New Home cards today! 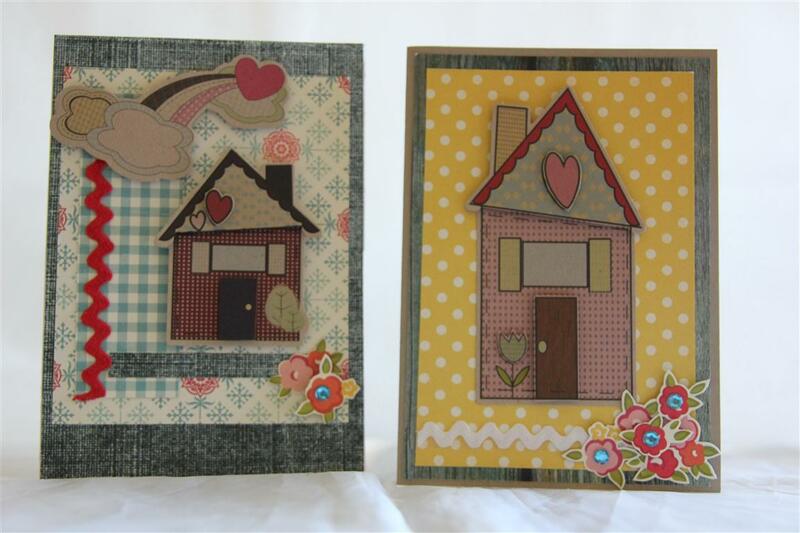 These two cards were made with October Afternoon Farm Girl papers. The one on the left has some interesting layering on it, which used up a little bit of the scrappy off cuts I had on the table left from previously made cards.I fussy cut some of the little flowers from another sheet of farm girl paper, and added some ric rac and Kaisercraft rhinestones.The houses were from the same kraft sheet as my previous post, I have had them for at least 2 years, and can’t reemember what brand they were, but they match this paper beauitully, and I have managed to use up a little more stash! I taught a class this morning, and I picked up some Tim Holtz glass bottles. I am going to make my husband a Valentines day card and put one on the card with a message inside it – I will post it when I have done it. Til tomorrow…. Nothing but headaches with my blog today – why do wordpress keep changing things, just as I learn how to do it the old way?Anyway,I bought some new dies a little while ago, -Madison window die and various accessories so over the next couple of days I will show you what I have been creating with them.Today I used kaisercraft Miss Nelly papers, and a Tim Holtz bricked embossing folder ( which I swiped with ink before embossing) for the brick wall.I used the madison window die, and backed it with some acetate, and more patterned paper. I filled the Poppy stamps window box die with flowers and leaves punched from my Martha Stewart punches and the Bike was stamped using a stamp from stampin Up Pedal presents stamp set. I hope this post makes sense – my computer has been moved into the room that my Galah resides in while the computer room is being painted and the whole time I have been typing he has been making the same tap tap tapping sound s behind my back – he is very distracting and highly entertaining – cheered me up no end!